Buy QuickBooks Desktop Enterprise - Productive Computing, Inc.
Intuit QuickBooks Desktop Enterprise 2019 offers end-to-end business management with advanced user permissions and capabilities. It is loaded with special features, tools and reports for specific industries, including contracting, manufacturing and wholesale, non-profit, retail, professional services and accounting. QuickBooks Desktop Enterprise 2019 gives you the tools to work faster and spend more time on your customers. It's efficient and comprehensive- scale from 1 up to 30 users, without giving up control over user access. * End-to-end workflows empower Enterprise customers to pay employees, track inventory*, and run reports, all in one place. It's flexible and tailored - Enterprise supports hundreds of thousands of users, items and vendors — more than 6 times the capacity of other QuickBooks products. * QuickBooks Desktop Enterprise offers unique solutions tailored for the needs of retail, contractor, nonprofit, manufacturing and wholesale organizations. It’s familiar - QuickBooks Desktop Enterprise has the same friendly, inviting interface that countless QuickBooks users have come to know and trust. QuickBooks Desktop Enterprise Silver 2019 - includes the functionality, support and business insights you'll need to get started. QuickBooks Desktop Enterprise Gold 2019 - offers the powerful functionality to pay employees, pay and file taxes, and streamline your payroll with enhanced QuickBooks Desktop Payroll. QuickBooks Desktop Enterprise Platinum 2019 - packs maximum functionality with advanced inventory and pricing features. Comes with valuable tools for manufacturers, wholesalers, contractors and retailers, plus tools to help pay your employees. 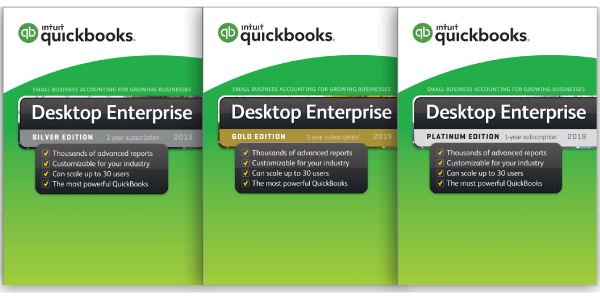 Don't see what you're looking for or need help choosing which QuickBooks product is right for you? Contact us for more information, any questions or custom pricing and quantities. We will match or beat any competitor's advertised price. 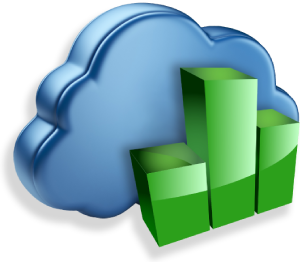 Host your QuickBooks Desktop file in the cloud with Productive Computing's FileMaker QuickBooks Hosting plans. As an authorized standard host for QuickBooks software, our hosting plans allow clients to access their QuickBooks Desktop files and FileMaker in the cloud simultaneously. * Restrictions apply, may cost an additional fee, or be subject to third party compatibility. Terms, conditions, pricing, features, service and support options are subject to change without notice. Please contacts Productive Computing for details at (760) 510-1200.